This 5.2klm walk is a pleasant and easy walk, with slight inclines and easy walking. It runs along side Booloumba Creek and wides its way up to the gold mine. 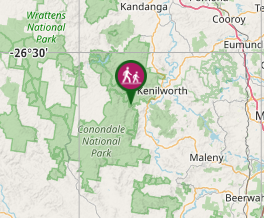 Drive approx 8km along the Mary valley hway from Kenilworth and turn right at the Booloumba Creek road. Turn right into the Booloumba 2 Day use area. You will however need a 4WD to access this area as there is a number of shallow creek crossings to cross. This 5.2klm walk is a pleasant and easy walk, with slight inclines and easy walking. 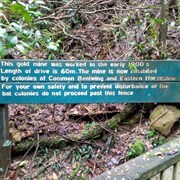 It runs along side Booloumba Creek and winds its way up to the gold mine. This walk is also the starting point of many other longer and shorter walks of differant fitness levels. We did this walk as part of the walk to Artists Cascades. It is a loop track, joining up with the Great Walk track 300m further down. We did it on the way back in a clockwise direction, but it would probably be easier anti-clockwise. The entrance to the mine isn't in good shape. 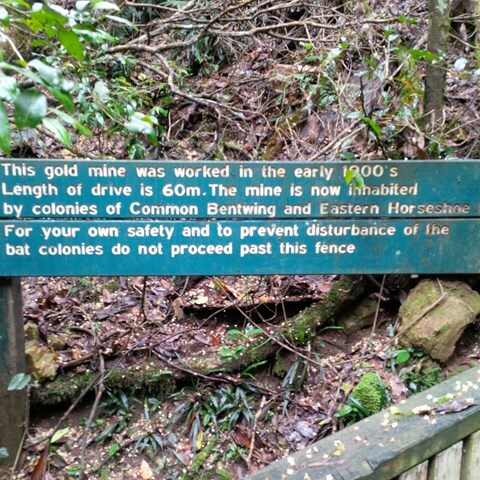 A tree has fallen over the top of it, not that you can go into the mine anyway. Take care. We did see a two metre long carpet snake near the mine. If you have no 4wd to access Booloumba Creek camp ground you can get here via Charlie Moreland camp ground BUT and it's a big BUT , you will need to hike over Mt Allan and back this round trip is almost 17.8km !!!!! A decent level of fitness is required and sufficient amount of time ! Wow, what a great walk. Rainforest, tracks in great nic. Great time of year to go. Access to the creek from this track worth a look. Crystal clear water. U can access the creek from any of the 3 (shallow) creek crossings up to No2 day camp area. Take the blow up lilo, the kids will have a ball.